Though the primary job of a curtain is to obscure light and keep out draughts, they are so much more than just a simple practical tool. A well-chosen curtain can tie the room together and add the pièce de résistance to any design scheme, completing the aesthetic of your home. At Homefords, we stock a wide array of eye-catching curtains in sizes and styles to suit any room. Having trouble making a decision? Not to worry – our handy buyer’s guide should give you some hints and tips on how to make the best purchase, but if you’re still in doubt, get in contact with us using the form below. We’ll answer any question as soon as we can. 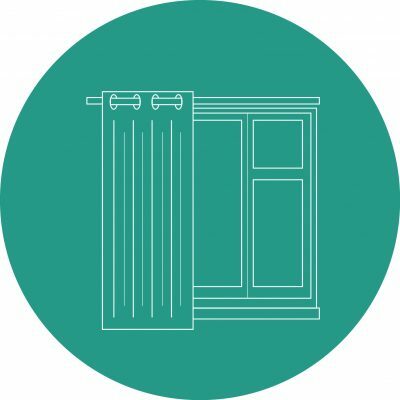 What are the different types of curtain? These one-size-fits-all curtains are specially design to be the right size for most standard windows and come in a wide array of patterns, colours and styles. Want enough substance to your curtain to maintain privacy, but still let in enough sunlight to illuminate the room? Voila! Voiles are the chic and sophisticated solution. Eyelet curtains come equipped with a series of metal-ringed holes at the top of the curtain, making for easy hanging as they slide right onto a curtain pole. They’re also sometimes known as ring-top curtains. So named because of their resemblance to a line of pencils when folded back, pencil pleat curtains are versatile in that they work equally well on tracks or a curtain pole. As the name suggests, door panel curtains are single curtain panels, designed to provide additional coverage over a door. Most commonly adopted for ornamental use, they also provide another layer of insulation during the winter months. There are a multitude of things to take into consideration when picking the right set of curtains for your home. A good starting point would be to ask yourself the questions below, then formulate a plan based upon your answers. Which curtain pattern would suit my home best? With such a wide assortment of styles and patterns to choose from, the optimal curtain really depends entirely on your individual circumstances. Do you want the curtains to be the main feature of the room, or to blend in seamlessly with the surrounding décor? If it’s the former, something bold and bright might be the best option; if it’s the latter, a softer, more understated style might suit your needs. Bear in mind the existing wallpaper and carpets in your home and be careful that the colours don’t clash or create too busy an appearance. Although curtain linings are not absolutely necessary, they can be beneficial in a number of ways. First and foremost, they generally improve the hang of the curtain, making it more pleasing on the eye. More practically, they can also increase insulation, which serves to keep warm air inside in winter and outside in summer. Are blackout curtains the right option for me? Specifically designed to prevent any light from coming through, blackout curtains are an ideal choice for those who struggle to sleep unless they are in perfect darkness. They can be particularly effective for children or those who work night shifts and need to sleep during the daytime. As well as the curtains themselves, what other accessories do I need? At the very minimum, you’ll need a curtain pole or track to hang the curtain from and curtain hooks if you are buying a pencil pleat curtain, you might also like to invest in tiebacks and hooks at either side of the curtains during daytime, to keep them pleasing on the eye. Furthermore, we also have a range matching cushions for a number of styles. Which is better – track or pole? Some curtains are only compatible with a certain type of fitting: eyelet curtains, for example, can only be hung on a pole. However, many styles (including pencil pleat curtains and voiles) can work with both. In these cases, it will come down to simply a matter of preference. Curtain tracks will be obscured by the curtains when they are closed and serve more of a merely functional purpose. Poles, meanwhile, can become an ornamental feature in their own right. What’s the best way to measure for curtains? It’s highly recommended to install the pole or track you intend to use before buying your curtains. If you don’t have one already, you can find out the correct length of pole or track needed by measuring your window width and adding 30cm to 40cm. Once you’ve got the correct length of pole or track, install it roughly 15cm above the top of the window, with at least 15cm to 20cm either side of the edges. Whether you have a pole or track, take care to measure the entire length of the fitting from end to end – see below. If it’s a pole you’re using, don’t count the finials (those are the ornamental pieces at either end). If you haven’t already fitted your track or pole in place, we recommend doing this before taking any measurements. Your track or pole should be fitted approximately 15cm (or 6 inches) above your window recess. Make sure it is in the centre and that there is a 15-20cm (or 6 – 8 inches) overlap at both sides of the window. If you’re not going to fit the track or pole, you can simply measure the window’s width then add 30 to 40cm (12 – 16 inches). This will ensure your curtains will comfortably cover your window. You’ll want to create a loose, laid-back aesthetic when your curtains are closed. To do this, simply double the measurement taken from the length of the pole and select the closest ready made curtain width. This will ensure that the curtains fully cover your window and look attractively ruffled when closed. Remember, the curtain sizes in our shop are for a single panel, and most curtains actually have two panels. There are three main options when it comes to deciding where you’d like your curtains to end: at the sill, just below it or at the floor. If you’d like sill length curtains, you’ll need to measure from the top of the curtain rail to the sill. If you’d like curtains that reach just below it, you should measure from the top of the rail to 15cm below the sill. If you want floor length curtains, measure from the top of rail to the floor. This will give you the correct curtain length for the style you desire. N.B. 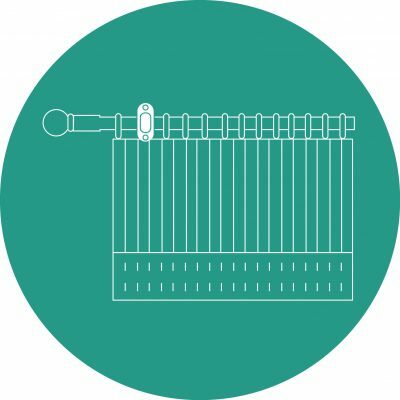 (1) If you have a radiator beneath your window, as many homes do, it’s imperative that your curtains end a minimum of 3cm above the radiator. Otherwise, the heat will rise up and become trapped behind the curtain, rather than circulating around the room. N.B. (2) If you’re using a curtain pole with pencil pleat curtains and want to accentuate the ornamental features of the pole, measure from the hanging rings rather than the top of the pole – see below and take 1.5cm off your measurements so the curtain doesn’t drag on the floor or window sill. In all other instances, measure from the top of the pole or track. It’s important to remember that floors and window ledges are not always 100% level. 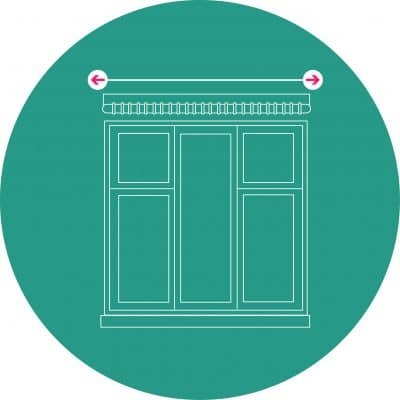 Therefore, measure at two or three different points along the width of the window and use the smallest measurement to make sure you get the snuggest fit. Just as you’ll regularly vacuum your carpets and wash sofa and chair coverings, curtains also require care and maintenance every now and again. Depending on the fabric and colours used in each individual curtain, it will require its own unique cleaning procedure. Be careful to check the instructions or label to avoid damaging, discolouring or shrinking your curtains. Curtains are often hung from a significant height and can also be quite weighty to boot, so if proper care and attention is not taken, there’s a possibility you can cause injury to yourself and damage to either the curtain, the wall or the surroundings. The main thing is to ensure that the pole or track is securely installed. 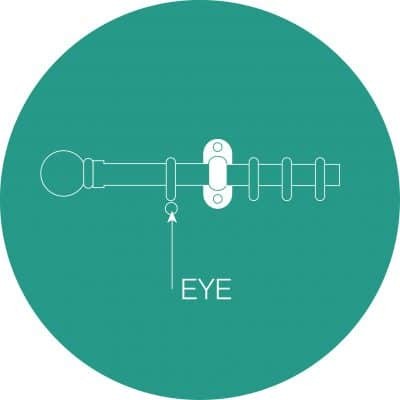 For this, you’ll require the correct screws, raw plugs to hold them and a drill to carry out the work, as well as goggles to protect your eyes from any dust you might create. Hanging curtains is generally a two-man job (especially if you’re working at height and using a ladder). It will be much easier, quicker and safer if you get a friend to help, so avoid tackling the job alone unless it’s a particularly small window.